Traveling for a month in Southeast Asia, visiting Singapore, Cambodia, Vietnam, Laos and Thailand, was the result of a desire to visit omy younger son, who is working as an epidemiologist in Phnom Penh, Cambodia. In my mind, geographically, I had that part of the world scrunched together. I was taken aback when I realized that one–third of the trip from Houston to Singapore was the flight from Tokyo to Singapore. In Singapore, the massive Chinese New Year parade had each ethnic group with a float, band or dance group, including a San Francisco group. The streets of Phnom Penh were a sea of motorbikes with occasional island of an auto. With so few traffic lights, turning left, for example, presented an interesting challenge. Visiting the ‘Killing Fields’ and S-21 (the school turned into a prison, torture chamber and slaughter house) produced a mind–numbing state of horror. It was awesome to find oneself unable to find ground to walk on that did not contain embedded scraps of clothing and bones. Our son says that everyone he has met lost at least one family member during the Khmer Rouge years. One of every eight persons was killed. Hanoi was a surprise. I didn’t know what to expect, but what I did find was a delightful surprise. I noticed a lack of animosity toward Americans, partly due, I was told, to the fact that half the population was born after the American bombing of the country. In a hole–in–the–wall eating place (only one item on the menu: pork noodle soup, which was absolutely delicious), I suddenly found myself in a conversation with a Vietnamese woman, originally from Ho Chi Minh City, who had worked at NASA in the Houston area and is currently retired in California. 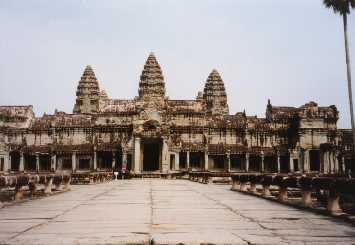 Siem Reap, Cambodia, contains the magnificent Angkor Wat temple. There are dozens of other temples as well, but Angkor Wat is the crown jewel. I found myself immersed in a history for which my education had left me unprepared. As in Europe, kingdoms rose and fell and, while in power, left magnificent monuments. Upcountry in Laos, in the sleepy town of Luang Prabang (pop. 30,000), numerous Buddhist temples are found. With ranks and ranks of statues of the Buddha, I found myself getting 'Buddhaed out' (a feeling similar to visiting numerous cathedrals in Europe). Even in this out–of–the way place, there were seven ‘internet cafes,’ places that had four to ten computers hooked up to the internet. All along the trip, I received and sent e–mails. On Lao Airlines (we used seven different airlines during the trip), an airline that UN and NGO groups do not allow their workers to fly, white clouds suddenly poured out of the vents (vapors like those in a car when the AC freezes). The hardy travelers began to laugh and some stood and took video pictures. The four weeks between Singapore and Bangkok—visiting Cambodia, Vietnam and Laos—we saw not one MacDonalds. At the end, we all went to an upscale restaurant in Bangkok—“Cabbages and Condoms.” Some of the profit from the restaurant and gift store is given to the public health sector of Thailand. Instead of a mint accompanying the bill, each person received a packaged condom. Americans, for being such a monolingual culture, are truly fortunate when traveling. So many citizens of other countries, even those not well–educated, are learning English. In addition, when young travelers from Denmark, France, South Africa and Japan want to talk with each other, they find English to be the common language. The world is delightfully fascinating.